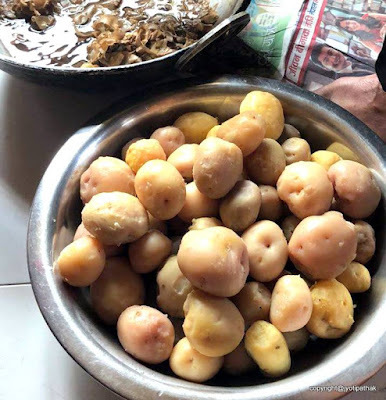 Potato achaar is a popular, addictively delicious, flexible, and refreshing potato dish typically served as a side dish to accompany the Nepali staple Daal-Bhaat-Tarkaari combination meals. It is made from boiled, peeled and cubed potatoes. 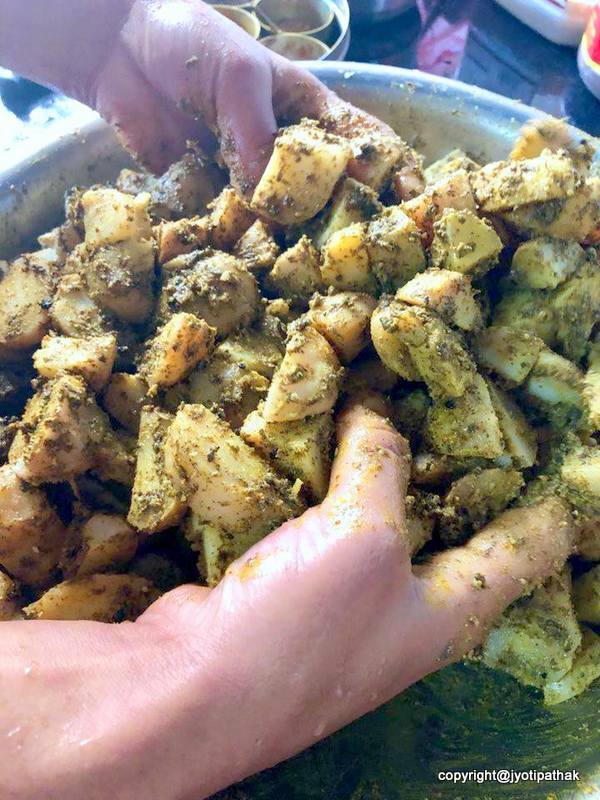 These potatoes are mixed with seasonings and many other ingredients. 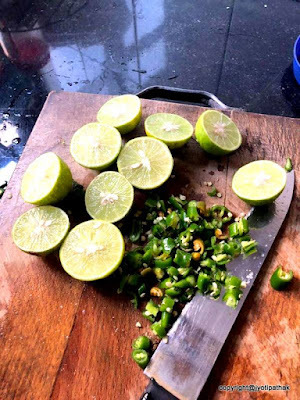 They are finished off with whole tempered spices and are topped with fresh cilantro. 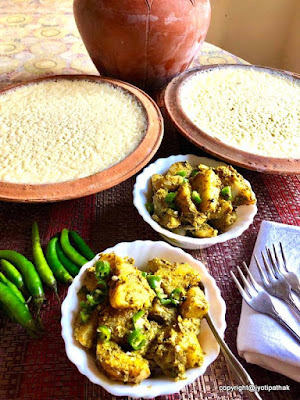 Although it is called an achaar dish (pickled), it is more like a side vegetable dish since it is served at room temperature. Only rarely have I come across a traditional Nepali meal that is served without potato achaar. 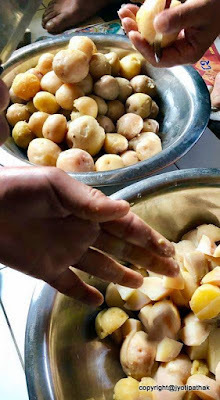 It can be served at any time of the day as a snack food with cheura or chewra (pressed rice flakes), sel-roti (fried rice bread) and poori (deep-fried puffed bread). It is often served during family gatherings, picnics and other casual functions or festive gatherings. For a Nepali bhoj (feast), aloo ko achaar is a must item. A large quantity of potato salad accompanies other ceremonial food items. There are many versions of aloo ko achaar throughout the country and each family has their own recipes depending upon their individual style and specialty. 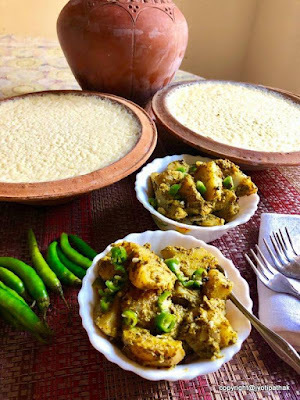 While preparing the traditional achaar, some add thinly sliced cucumbers, finely cut radish, refreshing crisp asparagus, spring onions, thinly sliced red onions, steamed banana blossoms, cubed bell peppers, hariyo saano kerau (field peas), green or yellow dried peas, and even sprouted mung beans. The dried, soaked and dehydrated peas are incorporated with potato raw for a crunch. There are endless variations. I have prepared this dish often and experimented with many variations -- I absolutely love it! For the following recipe, use any variety of potato that keeps its shape when boiled. Baking potatoes are not recommended because they produce a dry, starchy achaar. The potatoes should not be overcooked or under-cooked. Try to use freshly squeezed lemon or lime juice, as the bottled lemon juice with the preservatives take away the flavor of achaar. 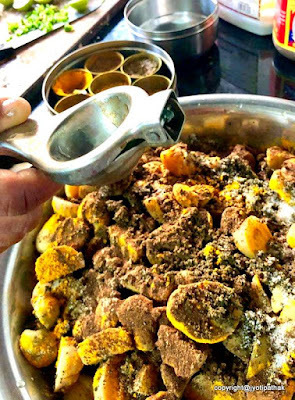 The following recipe was prepared recently during a small gathering with relatives. This is a good basic recipe, with simple ingredients and a quick preparation. You can have a delicious achaar in no time. Grab some potatoes, brown sesame seeds, fresh lemons, bell pepper, and other combinations of seasonings and let me show you how to make this traditional dish. I hope you will be making this dish again and again. In a medium saucepan, place the potatoes and enough water to cover, and bring it to boil over high heat. Reduce the heat to medium-low, cover the pan and continue cooking until the potatoes are fork-tender, 20 to 25 minutes. Drain, and when cool enough to handle, peel and cut the potatoes into 1-inch cubes. Do not pour cold water over them to cool the potatoes, as this will water down their flavor. 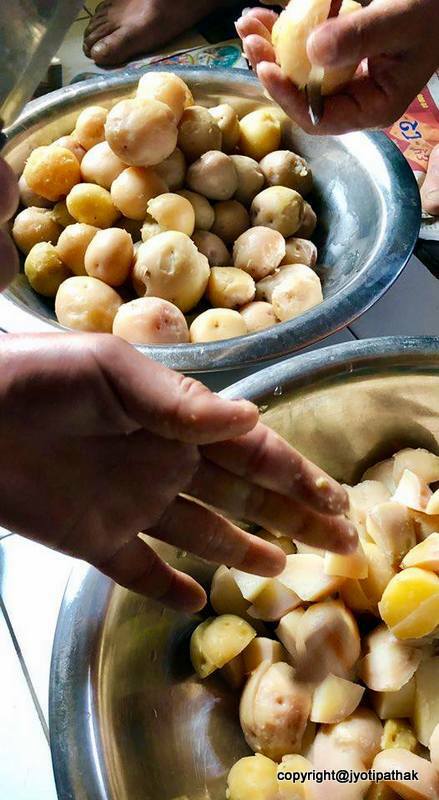 Place the potatoes in a large bowl and combine them with the green chilies, cilantro, lemon juice, red pepper, and salt and mix well. Set aside. Heat a small skillet (preferably cast-iron) over medium heat and toast the sesame seeds, dried chilies and timmur, and dry-roast them, stirring constantly with a wooden spoon to prevent the seeds from flying over, until they give off a pleasant aroma and sesame seeds are a few shades darker, about 3 minutes. 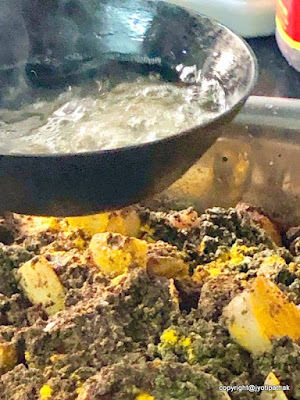 Remove the spices from the skillet and pour them into a dry container to stop from further roasting and let them cool. Then transfer the spices to a spice grinder and grind to make fine powder. Add the ground spices and 1/2 cup of water to the potato mixture and mix well. Heat the mustard oil in a small skillet over medium high-heat. When the oil is faintly smoking, add fenugreek, jimbu, and fry until dark brown and fragrant, about 5 seconds. Add the bell pepper, ginger, turmeric, and asafetida and fry for 1 minute. Pour the entire contents over the potatoes and mix thoroughly. Taste and adjust the seasonings and lemon juice. Cover the bowl and let the potato achaar stand for 30 minutes at room temperature to absorb the seasonings, stirring occasionally. 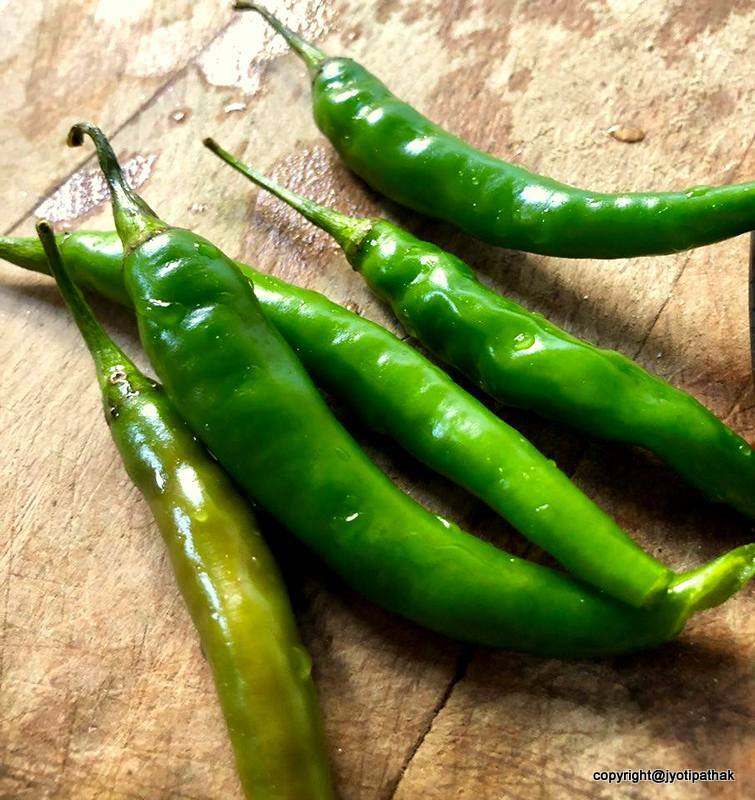 Transfer the achaar to a serving dish, sprinkle some chopped cilantro and serve. Variation Note: To give an extra twist to aloo achaar - as a variation you can add 2 cups of freshly chopped cucumbers, 1/2 cup soaked dried whole green peas, 1 cup freshly steamed asparagus or any ingredients of your choice.